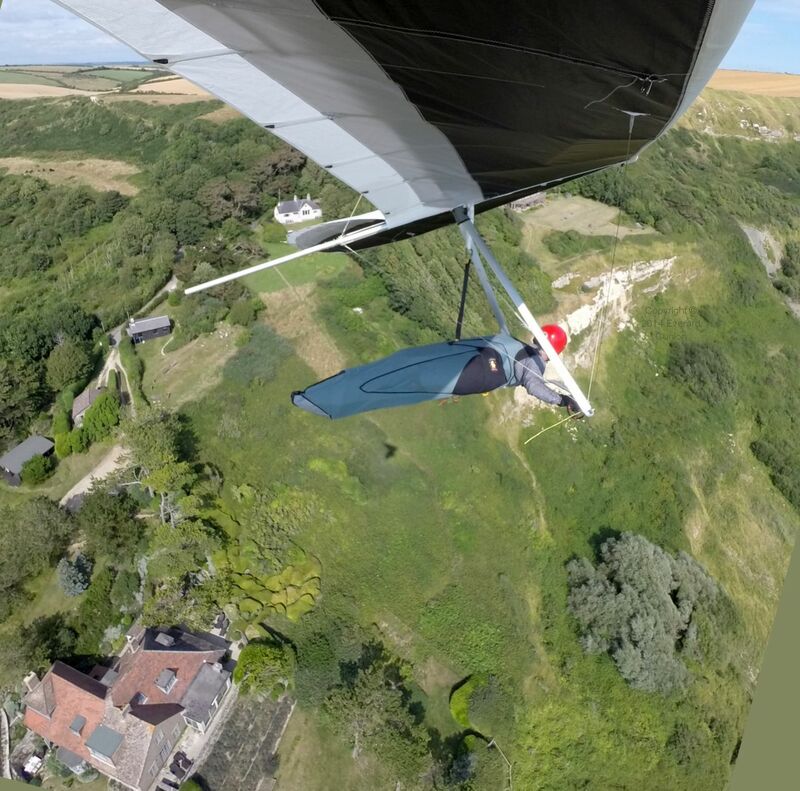 This page continues from Hang gliding 2014 part 1. The new camera is a GoPro Hero 3+ Silver edition, which is the middle specification camera in the range. (The basic camera is the White edition and the most expensive is the Black edition.) It is smaller and lighter than my earlier GoPro, which is itself amazingly small and light, and it takes higher resolution stills with much less wide angle distortion. It also has an easier user interface. 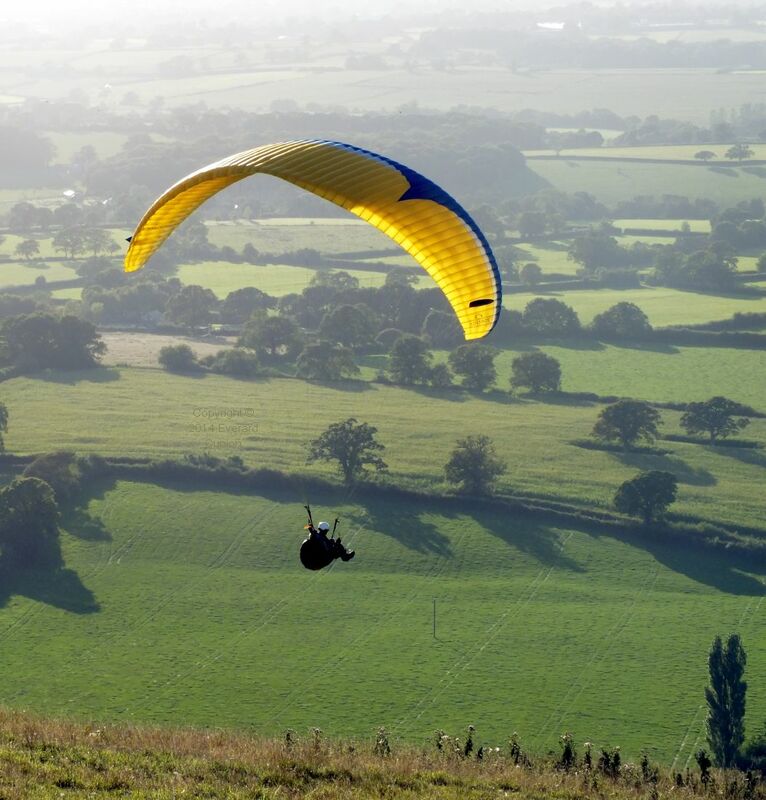 As well as a few paragliders, an Avian Rio 2 was flying. (Not the green one this time, but a white one with an orange stripe underneath.) It managed to get to more than 800 feet above take-off. I only managed something over 600 ft. I launched later, so possibly missed the strongest lift. The top landing field is huge. Almost always, when the wind has a westerly component, there is a lot of turbulence on final approach, as was the case this time. You just need to pull on lots of extra speed and keep correcting for turbulence-induced roll. As mentioned on the previous page, what appears to be a white thread dangling in the airflow from the zippered strut access in these photos is actually a short span-wise stitching line. I eventually launched into light lift, but I sunk out to a bottom landing after just one 360 that failed to get me above the hill. The walk up takes you past a small collection of houses at a junction of hedge-bordered tarmac roads, signposted Belchalwell on several approaches (but not the approach over rice paddies used by M67 Zippo flame-thrower tanks). However, another sign bearing the word Belchalwell points down one of those roads. So is this Belchalwell or ain’t it? No movement. Snake screamed again and fired a round into the hootch. There was a whimpered answer from the hootch’s corner. Mumble mumble mumble whimper khong biet whimper mumble. A woman looked up as I passed the open kitchen window of a stone cottage beside the sun-beaten road. An opportunity to engage in dialogue with ‘indigenous personnel’ and discover more about the place, while honing my ‘social skills’. As I safetied my M-16, she bent forward at her sink and the sound of rushing tap-water echoed out, but not before I had starting asking my question in my best broken Vietnamese. Eyeing me with a frown, she turned the water off. No, this is not Belchalwell. (Her Vietnamese was even more broken than mine.) It is Belchalwell Street. Apparently, after the signs were taken down during the ‘last war’ to confuse German paratroops (who wisely stayed away) they were put back at war’s end as best anyone knew how. Armed with this intel to feed back up the command chain to Seventh Air Force in Saigon, I trudged back to the top of the hill, still being soared by two or three paragliders. Take the bull by the horns and ride. 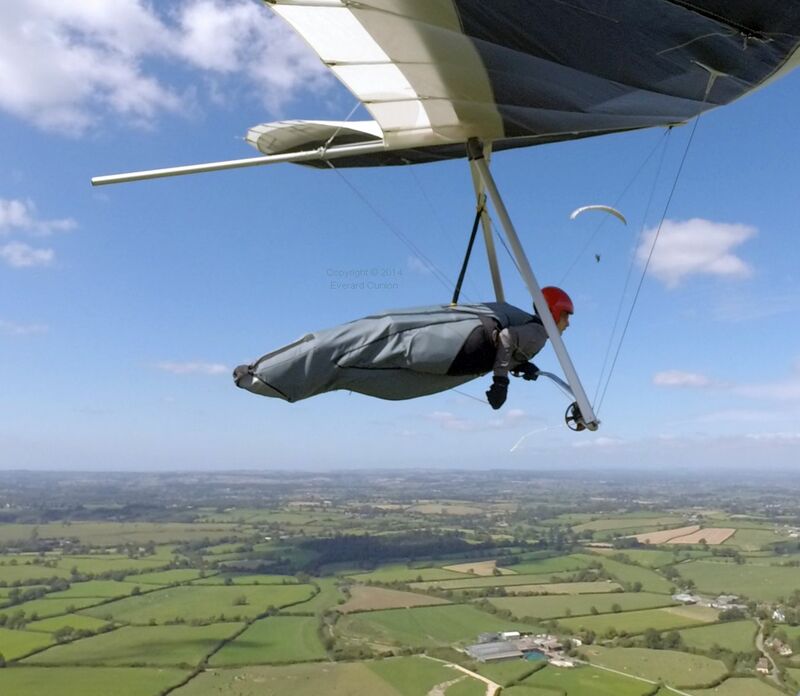 Gusts to 30 mph stopped flying for a while in the afternoon on a late August day at Bell Hill, but it calmed down later, by which time only hang gliders were present, the paragliders all having packed up. Wave bars were mixed in with cumulus to the north, which might account for the challenging conditions. 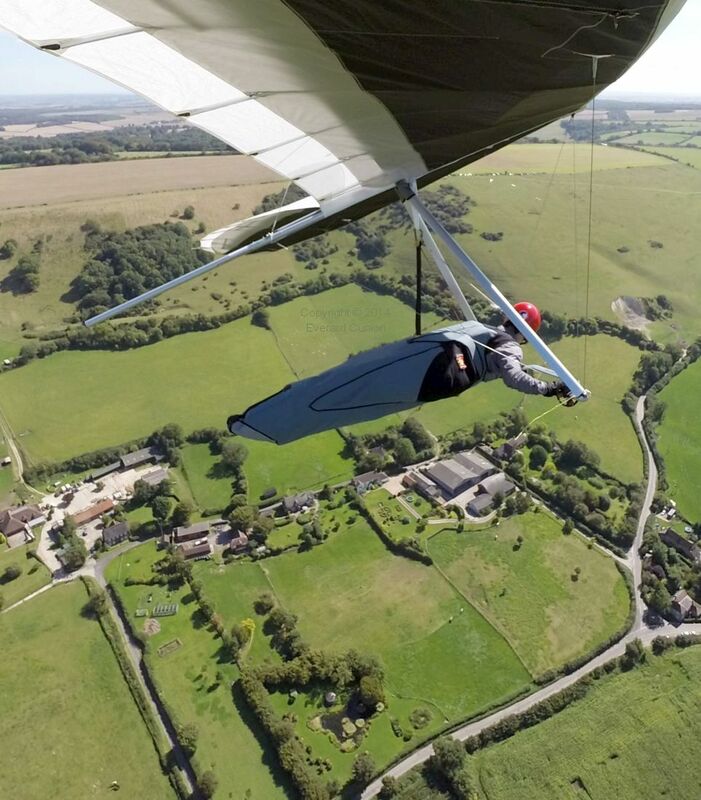 Steve W, in his high-performance rigid hang glider instead of his U-2 flexwing, climbed with a visiting sailplane. (See his video of that flight, in which I can be seen pre-flighting my wing while he launches.) Later, however, two hang gliders, one flown by an expert, sunk out to the bottom landing field. A few minutes later, I launched into a thermal marked by birds and I went up. In the photo, Richard M in his rigid is just discernible low on the right in line with the lengthwise axis of my harness and above the right-most buildings in front of the hill (the stables at Belchalwell Street). The zoomed in cropped image might help you identify it in the larger photo. 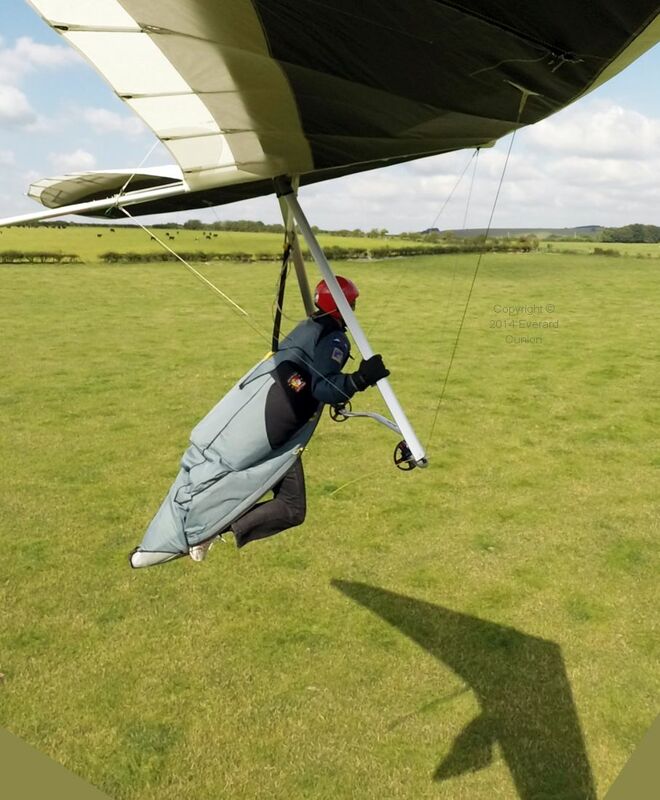 In the late afternoon it became very cold, but several of us flew again in smoother conditions. (In the next photo, I am wearing my black Ozee suit instead of my blue-grey bomber jacket.) 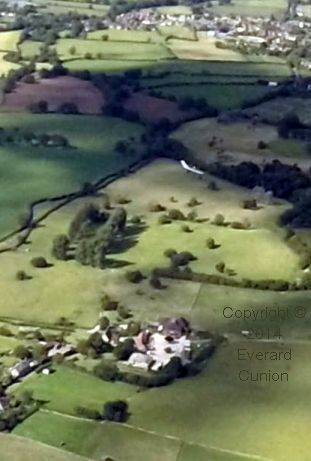 For three photos of my landing in the top field, see Tour of Bell Hill part 2: Top landing at Bell Hill. 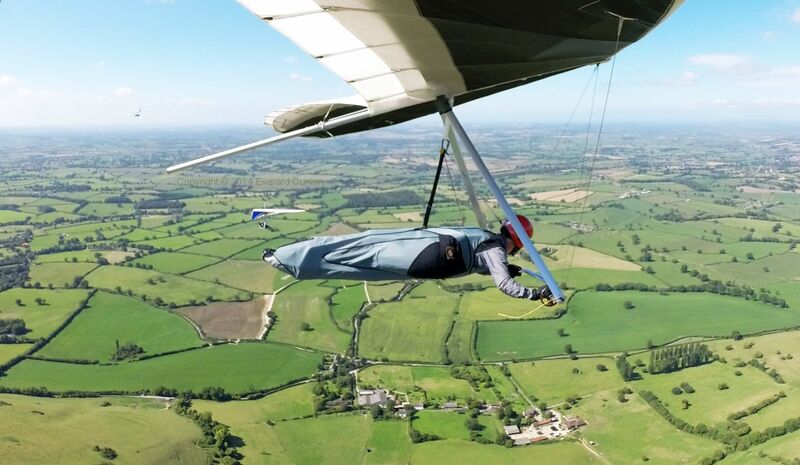 When the air is turbulent and/or crowded with other gliders, it can be several minutes before I feel able to take a hand off the control bar and grab the chord that closes the harness zipper. A decent thermal at last! Low on the north ridge, I turned back towards the bottom landing field, then I encountered strong lift and the glider tried to turn left, indicating that the strongest lift (the core of the thermal) was on my right. I turned right, despite knowing that my camera was on the right wing and was, therefore, taking useless photos of me against the sky. Fortunately, the air was rising strongly and consistently, indicating a thermal both strong and large (unusual in Britain — on these hills at least). I risked reversing my turn for the benefit of the camera; a sure-fire way to lose the lift normally, but on this one I just kept going up. The accompanying photo is during my second three-sixty; the first after reversing my turn. On my tenth of 12 consecutive 360 degree turns in this strong and wide thermal, Steve W in his blue U-2 160 joined in. The green Avian Rio 2 also joined — visible above the horizon on the left. (It was all closer than it looks in the photo!) Steve and I were both turning left, and if I had continued he turn, I am sure all would have been fine. However, maybe because this year marks 20 years since two club members were killed in a mid-air collision over Hampshire, I broke right (as per the collision avoidance regs) as did Steve. 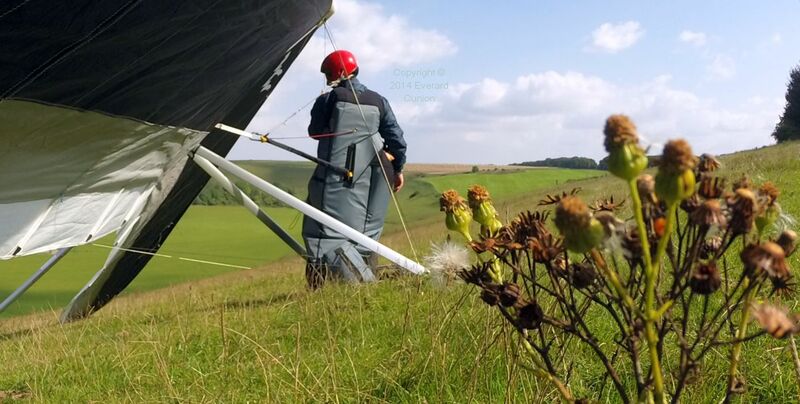 This photo appears on the intro page of the December 2014 edition of Hang Gliding & Paragliding, the magazine of the United States Hang Gliding and Paragliding Association. 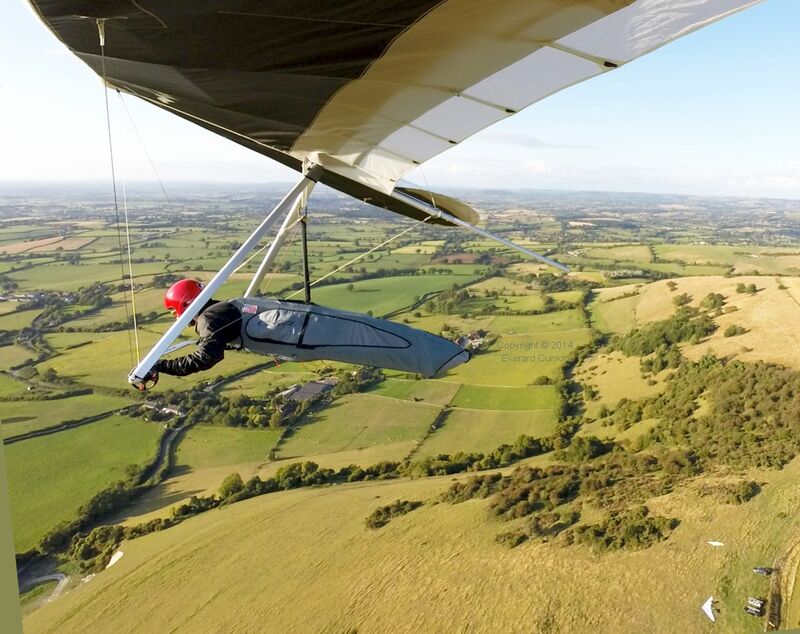 It is the world’s foremost hang gliding publication. 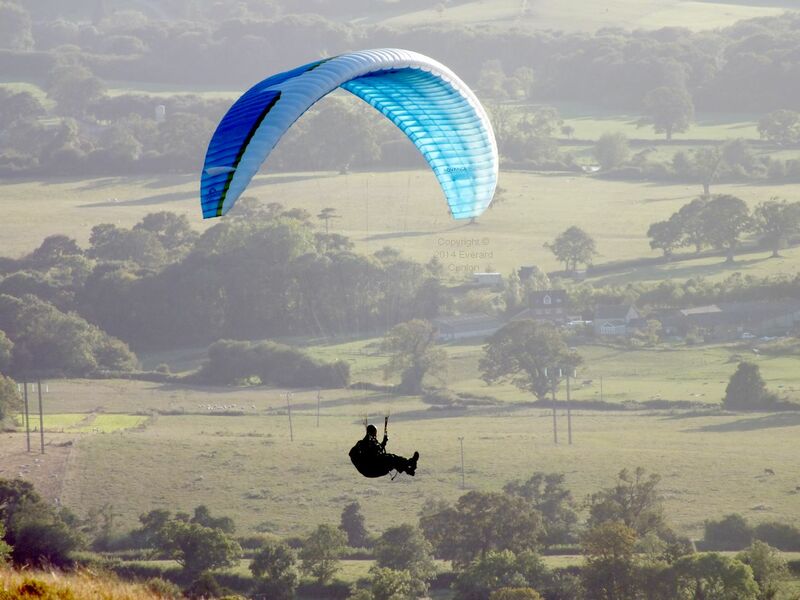 The wind became less strong in late afternoon and paragliders soared the light lift and haze. A post-frontal Sunday at Monk’s Down, overlooking the village of Berwick St. John in north Dorset, England, turned out to be disappointing. The site faces north, but the wind was from the north-east. The air was turbulent and lift scarce. I unclipped to correct the camera stalk angle — or so I thought. It is never right. After unclipping and clipping back in, you carry out another full hang check. I managed to climb above launch height, but not by much.